Since the Super Bowl is coming up, I thought what better time than to share some of my favorite sport parody Twitter accounts. They all will most likely be tweeting throughout the duration of the game, so if you want a few laughs while you watch, you should definitely follow some of them. 1) @PeytonsHead- My personal favorite! Essentially the Twitter is from the viewpoint of Peyton Manning’s head and since the Broncos are in the Super Bowl, his tweets during the big game should be even better! He always has a lot to say about other sports and current events, so this account is a great follow no matter what time of year. 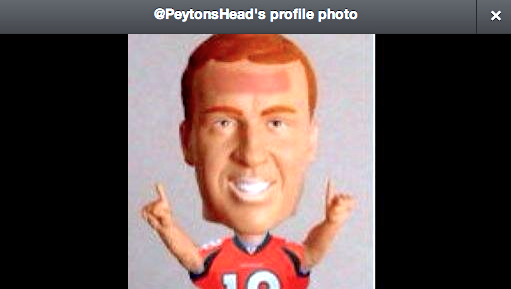 My favorite part about this Twitter is the profile picture of Peyton’s face with his forehead all red. If you see Peyton ever take his helmet off during a game, his forehead is always red, so the Twitter’s accuracy is pretty hilarious. I also love when he tweets #TextsFromEli where the tweet shows a “conversation” between the two of them. 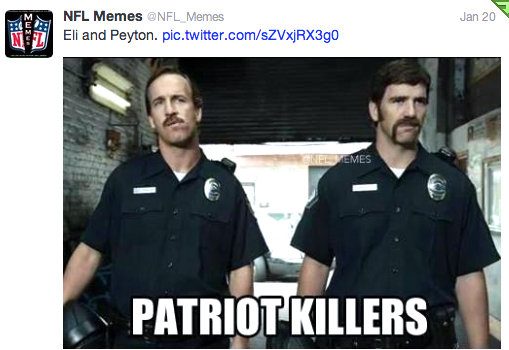 Basically, if you like Peyton Manning this Twitter is a must-follow. 3) @EvilMikeTomlin– Based off of the head coach of the Pittsburgh Steelers, this Twitter is mostly all-things football, but pokes fun at some other sports and current events as well. He tweets frequently each day, so during the Super Bowl I’m sure there will be a tweet for every minute of it! As for the username, he is pretty evil if you’re a Patriots or an NBA fan since he hates both, but I think his tweets are pretty hilarious. 4) @TheFakeESPN– They cover almost every popular sport and aside from funny tweets, they are known for writing humorous headlines too. They’ll frequently post headlines that were created by themselves or submitted by other Twitter users and attach a link with a photo or video. What’s cool about this page is that they’re pretending to be a real sports news source but their tweets and “news stories” are all just a mockery. 5) @ShermanRants– Since Richard Sherman is still one of the top two athletes being talked about up until the Super Bowl, what better Twitter to follow? This account just started after his well-known NFC Championship post-game interview, and although I don’t know if there will be any tweets after the Super Bowl, I’ll definitely read some of Sherman’s “rants” up until the game. Every tweet posted is in all caps to emphasize his yelling, so that fact is pretty funny in itself. If you want to check out other well-known sport parody accounts there’s also: @TomBradysEgo, @FakeSportsCentr, @CaptTouchback, @NotBillWalton, @OnionSports, @FauxJohnMadden, @FunSkipBayless, and tons of others for specific athletes/coaches/reporters. Definitely check out some of these Twitters especially on Super Bowl day, since there will be a lot of funny comments worth retweeting.